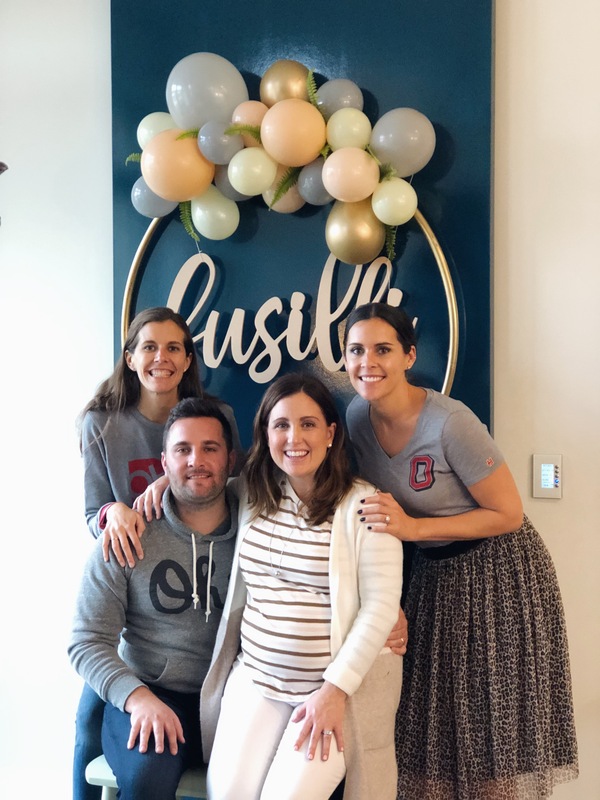 Last weekend I hosted my brother and sister-in-laws baby shower at my house. It took place during the huge Ohio State x Michigan game so I had to think hard on how to incorporate both. My brother and his wife live in Philadelphia so we did a co-ed shower so that we could enjoy his company. 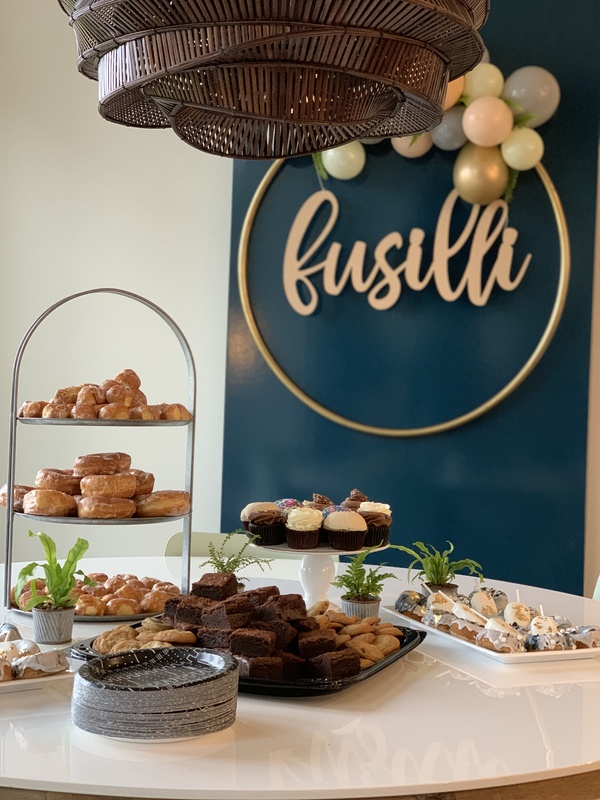 I knew I couldn’t dare interrupt the big football game with baby shower games so I had to strategically plan food, games and gifts as well as decorating. I love challenging my brain and figuring out how to make mom-to-be and dad-to-be happy was fun and interesting. A lot of people host co-ed showers but I have yet to see a baby shower cohesively collide with a football game. Let me remind you this wasn’t a football themed baby shower. Now on to the good stuff, below I’m sharing a few tips on how to make a baby shower football game party. Start with invitations. They don’t know the gender of the baby so the invitation needed to be neutral. I wanted it to be elegant since it was for a baby shower so I chose a marbled paper with gold text. At the bottom of the invitation, after sharing all of the shower details, I mentioned we would be watching the Buckeyes play so wear scarlet and gray. I wore my block “O” Homage tee to incorporate my alma mater tucked into a pleated leopard skirt (similar for under $30) with booties (similar here) to feel dressed up for the baby shower. If it were just a football game I would have had on jeans and sneakers, if it were a baby shower I would have worn a blouse with my skirt, see how I combined the two?? 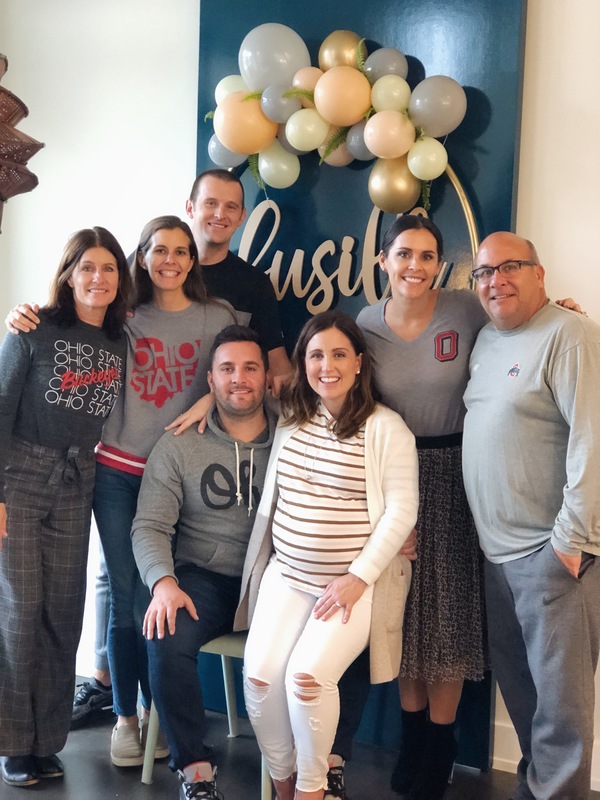 The scarlet and gray attire amongst the 40 people was enough Ohio State decor so all the decoration throughout the house were strictly baby shower related. I like for the decor go along with the nursery and in this case it is neutral since they don’t know the gender. I was told the nursery was tan, cream, gray and ivory so that is what I went with. 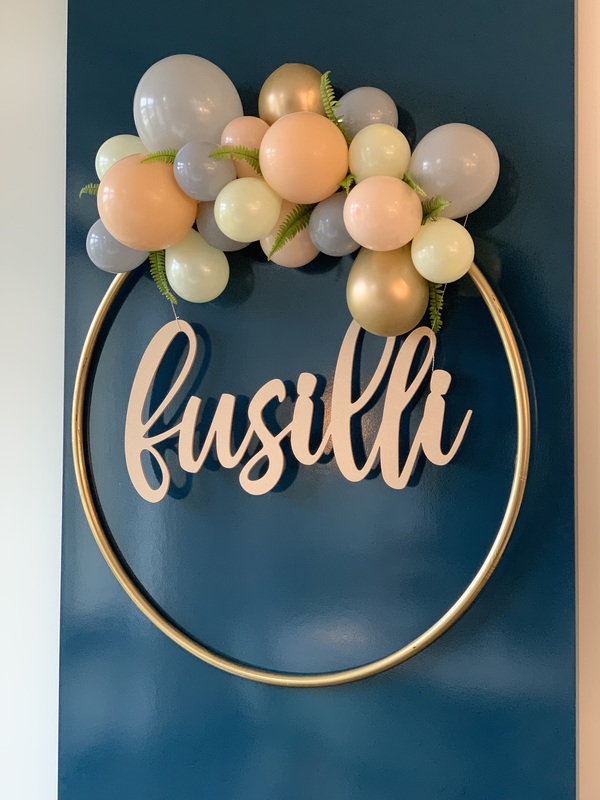 I was obsessed with balloon hoola hoop decor I saw on social media and knew I needed to make it. I order some neutral colored balloons, spray painted a hoola hoop gold, cut some ferns from my moms plant and got to work. The most important piece to this was the custom sign in the center. 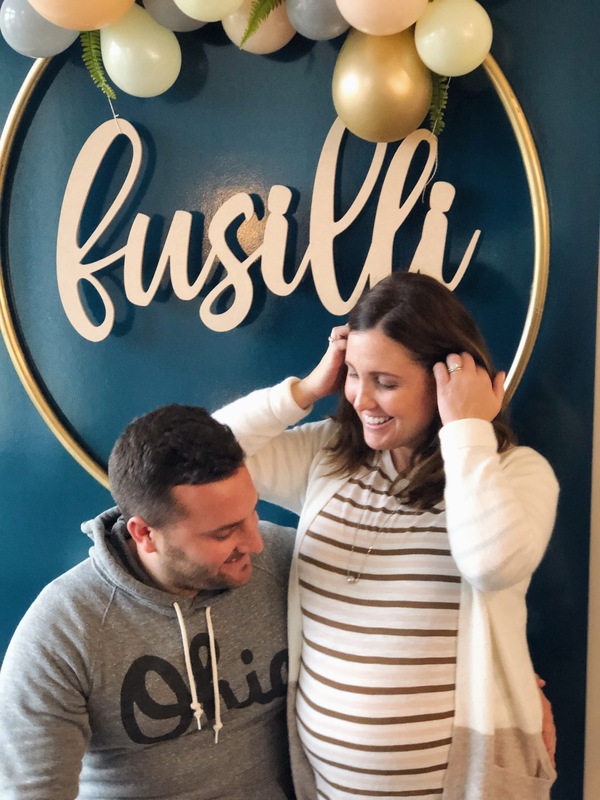 Baby names aren’t being revealed but they call it “fusilli” which is a type of pasta, haha- mom and dad are Italian so it is quite fitting! ** My readers get 15% off a custom sign, or any sign, at check out by entering code “livinglereve” at checkout. There are some adorable holiday options right now! 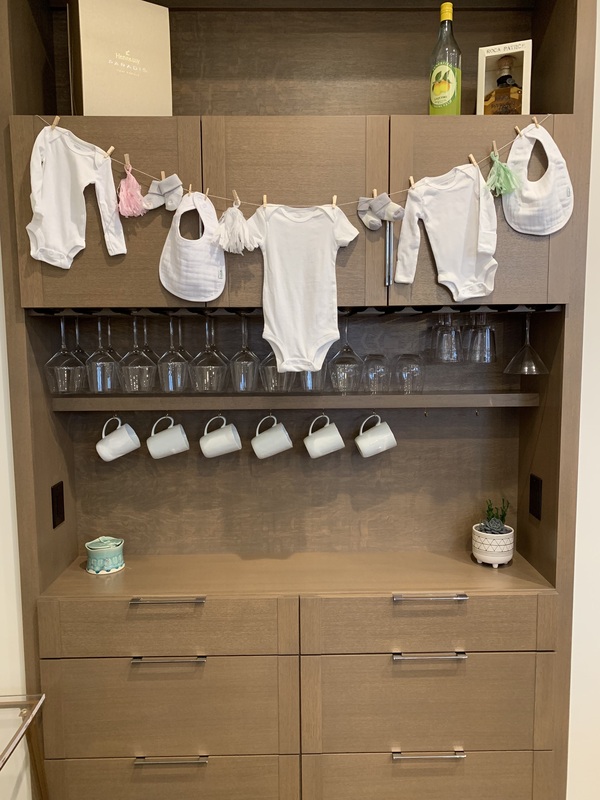 I also decorated the coffee bar and fire place wall with baby onesies, socks and bibs. I loved having the baby decor on the fireplace wall under the TV so while we were all watching the game we had a reminder we were at a baby shower! The shower started an hour before kickoff. 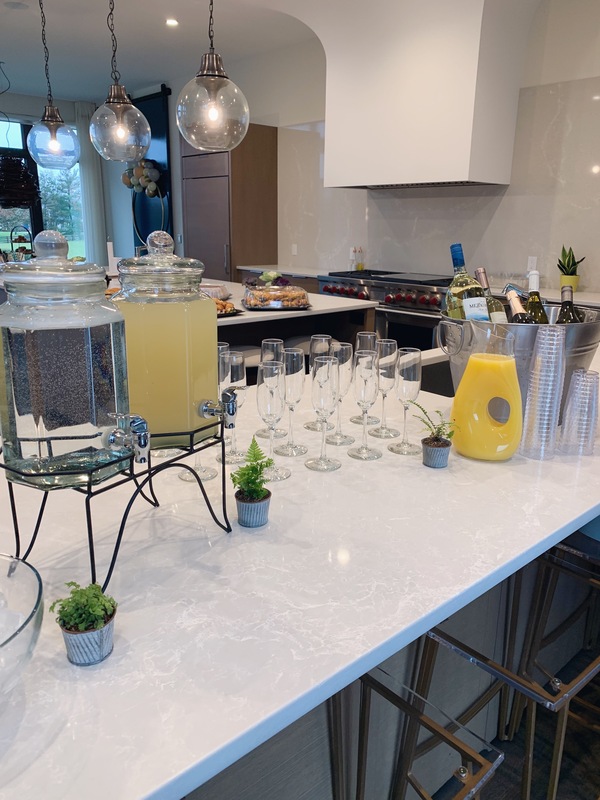 This gave everyone time to chat, mingle and eat. During halftime the guests played games while the parents-to-be opened gifts. I don’t want to hurt anyones feelings but guests don’t need to watch you open all your gifts and see every single item you open. It can take a very long time and gets repetitive. Having a game go on while gifts are being opened allowed guests to look at the gifts and engage with the mommy while enjoying the game. Of course not all games can be played while gifts are being opened but both of our could and we wrapped up just in time for the second half of the game. 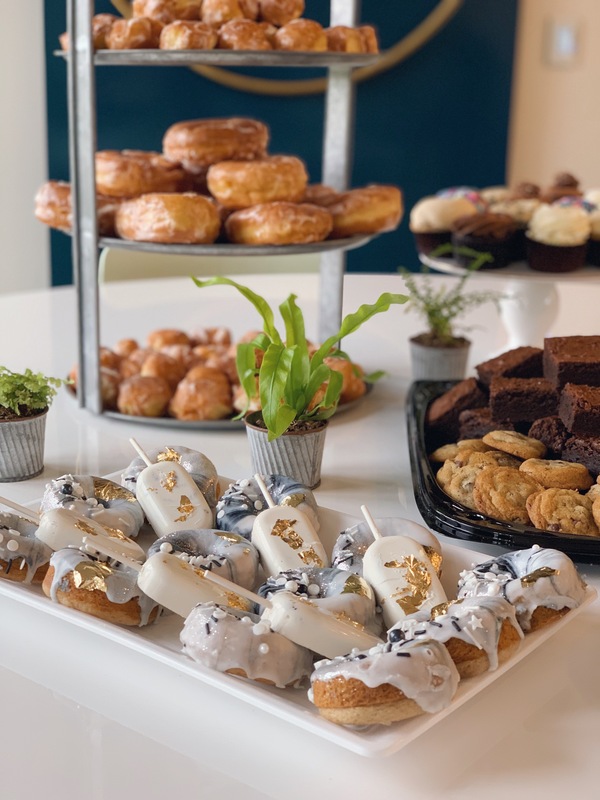 I had delicate sweets and pretty pastries to represent the shower aspect of our party. 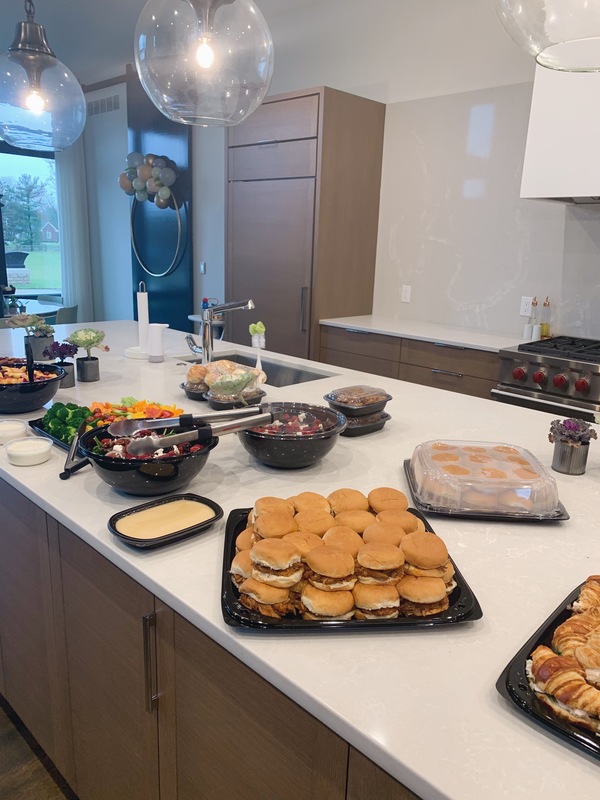 All showers need a good spread and since I was feeding about 20 men as well I made sure to have plenty of food to go around along with some finger food to snack on throughout the game.